RazorSQL 5.5, an SQL editor, database query tool, database browser, and database administration tool, is now available. Using RazorSQL, users can query, edit, browse, and manage all major databases from one tool. RazorSQL supports over 30 databases such as PostgreSQL, Oracle, MS SQL Server, DB2, SQLite, Sybase, Informix, and many more. 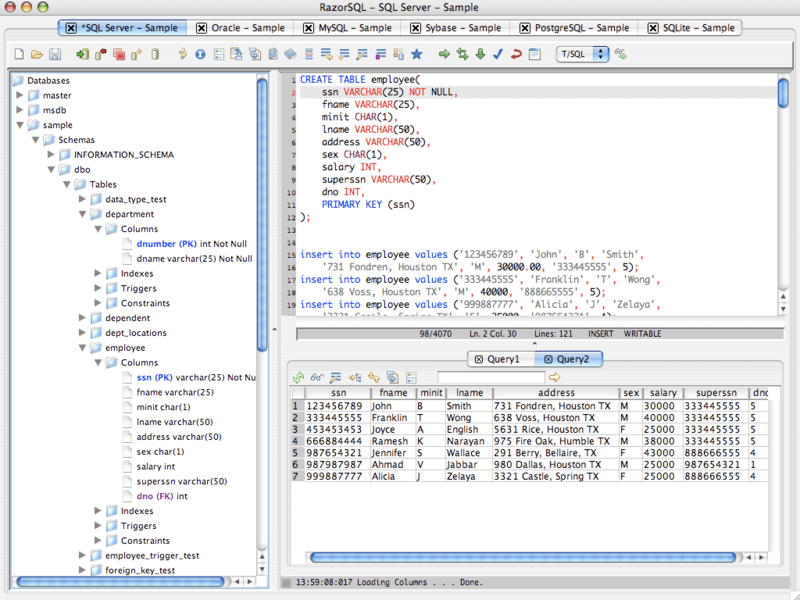 Some of the main features contained in RazorSQL are visual tools for creating, editing, describing, altering, dropping, and viewing database objects such as tables, views, indexes, procedures, functions, and triggers; tools for importing and exporting data in various formats such as MS Excel, delimited files, SQL insert statements, HTML, XML, and text; a database browser for the viewing of database objects and structures; search tools for searching for database objects and database data, tools for building SQL queries and generating SQL and DDL, a SQL formatting tool, SQL history tracking and and SQL favorites tool for storing frequently used SQL statements, and a robust programming editor and query tool with support for SQL, PL/SQL, TransactSQL, SQL PL, PHP, Java, XML, HTML, and many other programming languages that features tools for searching and replacing data, programmable macros, coding sidekicks for various programming languages, a file system browser, function and method browsers, and much more. New features in version 5.5 include enhanced PostgreSQL function editing, support for SQL Azure, enhanced auto completion, enhanced DDL generation, new HTML authoring tools, and improved performance. Versions of RazorSQL are available for Windows, Mac OS X, Linux, and Solaris. Pricing of RazorSQL starts at $69.95 USD for a single user, and tiered discounts are offered for multiple license purchases.